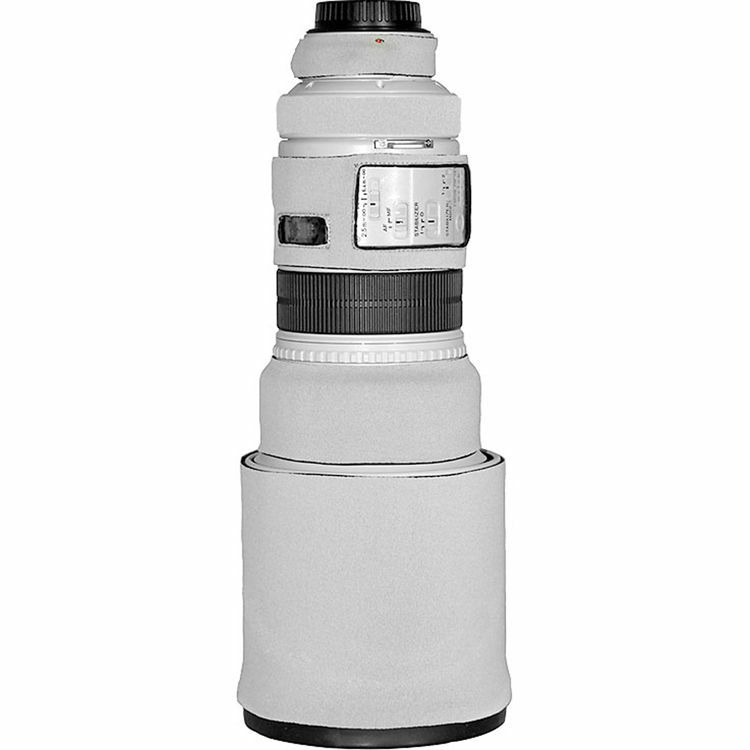 The Canon white Lens Cover for the Canon 500mm f/4 IS Lens from LensCoat covers the lens with a 100% closed-cell neoprene coat, offering protection from bumps, jars and nicks. This cover allows you to blend in with your surroundings. It is useful for nature and outdoor photographers, sports shooters and photojournalists. This version is all white and blends in well with snow or sand. The Lens Cover also provides a thermal barrier, protecting your hands from the cold lens surface in lower temperatures. It is easy to install and remove, leaving no residue on the lens. It is waterproof, providing protection to your lens in harsh conditions. Box Dimensions (LxWxH) 9.5 x 2.4 x 1.5"
Lens Cover for the Canon 500mm f/4 IS Lens (Canon White) is rated 4.7 out of 5 by 56. Rated 1 out of 5 by Ron from POOR quality & design!!! I purchased two of these - for both the Canon EF 300mm f2.8L IS and Canon EF 500mm f4L IS. They are just slopply made - stitching holes around clear plastic window started to rip open when putting the coat on the center portions of both lenses. There are no holes pre-cut in the clear plastic window for the various switches. You have to cut them in yourself. Instructions say that you can operate the switches without cutting - NO WAY!!! When you cut the respective holes, the window buckles and looks ugly. The only part that fits reasonably well was the cover/coat for the lens hood. The rest is JUNK. Rated 4 out of 5 by Squidcan from Good product but poor instructions Great protection for my new Canon 500mm F4 IS L lens. The only thing that I was disappointed in was the photocopied instruction sheet* that came with it. While there was a lot of written text there was only one hand drawn illustration of the 5 LenCoat pieces. I would have liked to have seen a photo included to have made the application of the pieces easier to follow. In fact I gave up on the instructions and just found a photo on the Internet of the pieces mounted on the lens which easily allowed me to finish. * For the retail price of this accessory instructions should should have include at least one photo. Also the addition of the LensCoat increases the diameter of the Len Hood making the original Canon E-163 Lens cap difficult to mount. If you do get it on it tends to crush/bend the LensCoat out of shape at the front of the lens. Rated 4 out of 5 by fizbot from a must for all 500mm users I didn't think that this would make a big deal in how I handled my lens as I find the L paint very tough anyways, but after putting the camo on I found I used the lens very differently as I didn't have to worry about resting it on the car roof or leaning up against any buildings or trees or railings as the neoprene covering gives just enough padding and protection from bumps and scrapes of both the lens and what you are resting it against. Only con is that it tends to peel back from the back of the lens hood when you use the stock lens protector that comes with the 500. Rated 5 out of 5 by Hickory leg from Canon 500 mm f/4L is lens is very good Easy to use and really fits tight. It serves two purposes. One as a protection and the second is camo. One more excellent thing aasit protects the switches from being shifted during walking in the forrest. Without this coat it's very likely that some of the function you have placed in a certain position will be shifted. Rated 4 out of 5 by Imagery Northwest from Overpriced.....But good protection Good and very snug fit, took me a few minutes to put all the pieces on. Like I said...Overpriced for 4 chunks of neoprene and some stitching:( In the big picture...Tis cheap insurance for expensive glass. Rated 5 out of 5 by Anonymous from Realtree Lens cover for canon 500mm f/4L I just got the Realtree Lens cover for my canon 500 f/4 IS lens. The lens cover is just what I wanted to protect my lens from scratchs, bumps and dings. The lens cover fit perfect and was easy to put on my lens. The cover was camo so it also works well when I am out into the field shooting wildlife photos. Great product I gave it five stars. Rated 5 out of 5 by Canon Shooter from A no brainer Next time you go out with your big glass chances are you will see others who also have big glass with LensCoats on their gear. Reason is they work as advertised, good protection for your lens and good company support if needed. I have them now on my 100-300, 300/2.8 and my 500. Excellent fit too and a small fraction of the price of the lens gives you good insurance against nicks and dings. Really a no brainer as I said to begin with. Is there adhesive on backside of the neoprene so that it stays in place? Answered by: FRIDH CORP E.